This is a Guest Post by Simon. You can find more help on selecting your ideal camera phone at best mobile contracts. So you’re looking for a phone that you can replace your compact camera with. It can be a bit of a hassle having to carry a number of devices around with you and being able to combine them to the best quality possible is great. For some the onus is on music and others the Internet but for those who want a good camera phone, there are now some that seriously rival digital compacts on the market. The biggest things to look out for when buying a phone with a camera is the amount of megapixels the shooter has and the sensor it comes with and the power of the LED flash, though there are other factors too. One of the biggest leaps in technology in the last year has been the introduction of the Exmor R Sensor by Sony. This sensor which is used in the company’s compacts also offers an excellent offering for those who want to have their phone do the shooting on the move. The Sony Xperia Arc which has the camera is not a one trick pony either and has an array of positive things about it aside from its 8.1mp shooter. Nokia also have an excellent camera option for those who want to shoot from their phones. 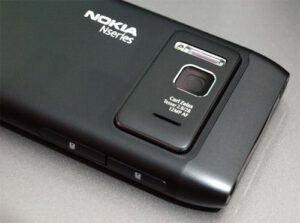 The Nokia N8 has a huge 12mp camera that is more than capable of rivalling compacts in the images it takes. It also has a huge sensor that ensures the quality of image is excellent. Although it is quite old, Samsung’s Pixon 12 had a lot to offer in the camera department. The names a giveaway as it comes with a 12mp camera with a huge 30mm lens for taking the best photos on a phone. It’s Auto-focus is also admirable and is definitely a plus. However, the rest of the phone is now a little dated by comparison. When purchasing a phone for camera use there are a number of other things that help. HDMI ports mean you can show your images on a large screen, monitor or television in full quality. This can really enhance the experience. DLNA Wi-Fi is also another excellent means of transferring recorded videos and captured photos to other devices such as your home computer. A large and high resolution mobile screen can also add a lot of satisfaction to those photos you took. The larger the screen the higher the megapixel ratio needed, however with the above 12mp shooters you’ll have no problems with the largest of mobile screens even zoomed in to a relatively high amount. The mobile phone industry is now also delving into the world of 3D, with devices like the Optimus 3D from LG and HTC EVO 3D sporting parallax screens. They both also come with 3D video recording and the ability to capture stereoscopic images. Like a lot of the current crop of top of the line smartphones they also come with 1080p video recording (for 2D videos), making them excellent choices for home movie making. Although many people are attracted to the megapixel count this is not the be all and end all as many other factors affect photo quality. If you intend to take a large amount of photos be sure to look for a phone camera with some form of flash, as you are likely to do most of your photography in darkened environments. There are a number of phones out there that offer an excellent photo experience but with the above advice and suggestions you’re sure not to go too far wrong. If you liked this post then also like DailyBlogging on Facebook. So which aspects do you look out for when choosing a good Camera phone ? Simon bascially writes on Technology related stuff. Really these are the very good features. From my opinion more then 10 MP camera should very good choice for better quality. Now adays many good model of mobile phones are available in market with best quality of camera. your ideas r really fine to choose cameras but every company have unique policy for their mobiles . Great tips. However, we must acknowledge that everybody has different requirements and needs for a camera phone. Some like good flash but some might prefer one with higher megapixels. I’m a big fan of SONY when point come for best camera. I love the clarity of it’s camera. I’ve learned not to get too caught up on megapixels, the complete package of the camera is what seems to be what makes a really good camera to me. At least thats been my experience. While on a recent trip, I realized I needed a camera with good ability to draw in all available light during the night. Using the flash is not always an option and if I want to take a picture that is exactly like what I am seeing in a dimly lit scene, what are the characteristics I should look for in a camera mainly? As a real estate broker, do I need a good extra camera with me and I have a Nokia N8 as my cell phone and camera, it’s perfect for work. Pretty nice tips to be considered while opting for a camera phone !! Great tips fro Buying Camera Mobile phone.But my best choice is Nokia N8. Thanks Mani for providing the best information here. I have had purchased a few camera mobine phone earlier and except the mP, I didn’t bother to see other parameters. I will keep in minds all the three factors as you have mentioned above. Thanks for providing the details.